One of the first people I met in New York last week was Bram Frankel, founder of William Abraham socks. Bram’s product is nothing less than a step change for the industry – something few companies achieve in a business as conservative as ours. 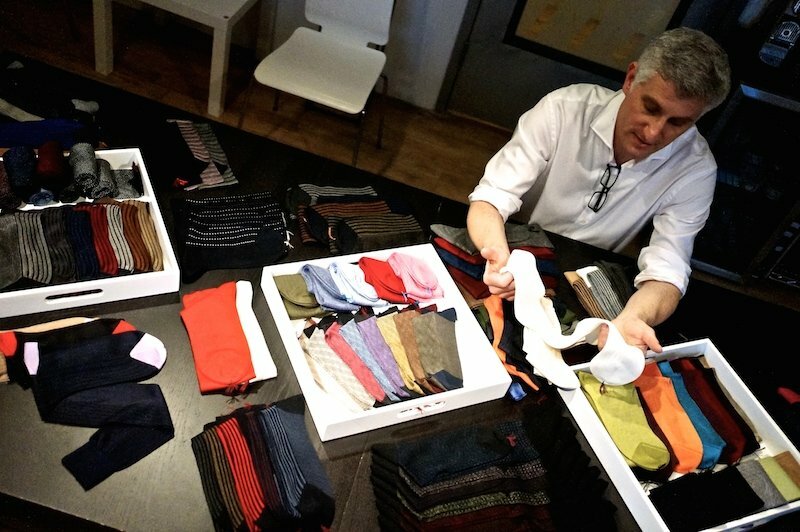 He has combined the finest materials with several original approaches to their combination – creating, for example, 100% silk socks that are substantial enough to be worn every day, and ultra-fine merino models that make them wearable all year round. They are very expensive, mostly between $68 and $120. But then people buy vicuna overcoats and bespoke alligator shoes. Compared to them, $90 socks are not that outrageous. I probably own 50 pairs of socks, but regularly wear 15. On those multiples, my $30 socks could easily be $90. Whether this is a vain attempt at justification or not, I applaud anyone that pushes the boundaries of craft in the luxury industry. There are few enough people doing it. Bram’s studio in Chelsea is in a block occupied by artists, designers and publishers. He and his assistant have two desks, one table and a lot of stock arranged around the walls. I often think merchandisers must fantasise about this kind of small, focused set up. Where you can actually see all your stock rising and falling, rather than having to track it through spreadsheets. Alongside the models already on the William Abraham site, Bram showed me a few being released soon – some this week in fact, following the trunk show at Leffot last weekend. They included cotton/cashmere mixes, which were gorgeous to the touch, and some more formulations on my 100% silk favourites. In fact, Bram has so many variations now that the range deserves some kind of three-dimensional graph to guide the consumer through the options. Perhaps on axes of formality, colour and opacity. Plus another one mapped on silk, wool and cotton. Maybe a little much for a start-up. You can read more about the socks on my original post here. In the meantime, here’s to the innovators. You can follow the discussion on William Abraham: behind the scenes by entering your email address in the box below. You will then receive an email every time a new comment is added. These will also contain a link to a page where you can stop the alerts, and remove all of your related data from the site. Is this business location open to the public or was it just a stop for you as a journalist? Just me I’m afraid. It’s his office. There are plans to have them stocked in various places though. Watch this space. As I really like socks, this was a very informative article. Also, I enjoyed your article on the Armoury Store in New York. I had an interesting conversation with a staff member there yesterday about Orazio Luciano and Ring Jacket clothes. In checking the PS blog I didn’t see any in depth reviews of either one of these brands. The Armoury is very high on both so more information on the quality of workmanship,design,fit,fabrics etc would be most helpful. Needless to say, I’m very excited about visiting that store on my next trip to New York. Looking forward to it. The Luciano line has my interest in that the founder was the head cutter at Kiton and the company is small and focused without all the crazy advertising expenses etc of its bigger competitors.The clothes,while certainly expensive,appear to be of excellent value given the significant amount of handwork in the garment. I’m looking for one or two quality brands that I can shift my attention to going forward and Orazio Luciano and Ring Jacket are distinct possibilities. As always, your articles are must reads for the man who is serious about quality men’s clothing and how to dress well with effortless style. Thank you for the work you do because it is certainly needed and appreciated. Your comments about Bram and his Willam Abraham socks is most accurate. The quality of materials used when blended with superb aesthetics makes for an excellent product. The Italian socks I buy from Mes Chaussettes Rouges are also terrific, but I have been delighted with WAs. Bram’s socks really are amazing. But I agree that the options are so dizzying that shopping for them in person at leffot was a far superior experience to shopping online. A good problem to have though! 50 pairs if socks, but you regularly wear 15. Does that include sports socks? The number of items in a wardrobe is something I’ve spent more time pondering this last couple of years. I could have a bigger wardrobe, but less somehow felt more. Now, it’s about balance. I wish I could afford these ultrafine merino… anything above £25 a pair of socks is a stretch for my budget. How would you clean socks of this material? Wash or dry cleaning? I live in a subtropical climate so socks have to be cleaned each day. We’re doing a feature piece on Bram Frankel and I love the shots you’ve got here on the piece. Did you take these images yourself? Could we use them for a feature in a magazine here in the UK? Hey Carl – no, they are Bram’s shots. Have you not talked to him? In terms of washing anything that is delicate, I have borrowed an idea from girlfriends. They have special mesh bags for machine washing their delicate garments. I have taken to using old pillowcases for fine shirts, etc., (put the garment in, tie the pillow case to seal it, wash on cold, gentle cycle) when it seems a bit much to do it by hand. I haven’t noticed any downside, and one gets the upside of machine thoroughness, both in cleansing, as well as rinsing (even when using shampoo on a sweater/jumper it is difficult to hand rinse, and remove all traces of soap scent). Hang/flat dry the garment after that.